" I was in a little bit of a creative lull and this was just what I needed! I had very little embroidery experience but with patience and instruction from Jess I created a beautiful piece. If anyone was thinking about having a go then I would recommend going to a workshop." "LOVED IT. All materials provided is an understatement! Thank you!" "I have been to 2 workshops and I always feel you are very generous in sharing your ideas and techniques which I really appreciate - thank you"
"Very enjoyable and lots of inspiring fabrics and papers to use"
Very friendly atmosphere, with help wherever needed, and a fascinating array of materials.."
I offer various contemporary stitch and embellishment workshops for beginners up to intermediate and advanced stitchers. 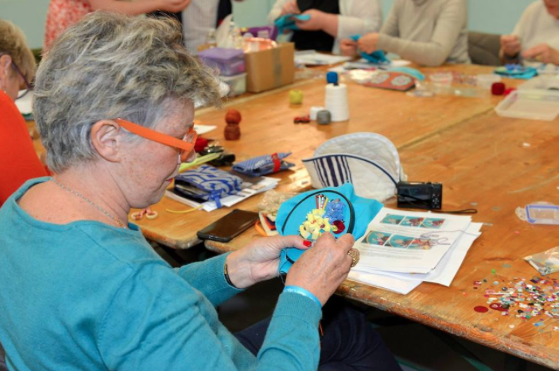 All of my workshops include materials, and I can guarantee a fun, creative and relaxing day! 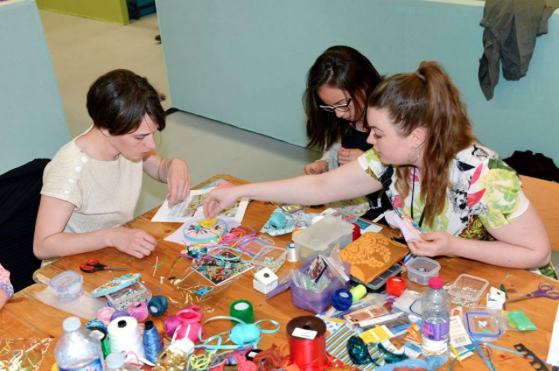 Regular workshops that I offer include; floral embroidery and embellishments, mixed media sequins, sketchbook- stitches mark-making and development day and dye/stitch/create. I love to share my unusual and colourful techniques and processes, and ensure that everyone leaves my workshop with a unique piece of textile art. Generally I run workshops in various venues in central York and Leeds with additional special venues throughout the year. I am also the Young Embroiderer's leader for the York branch, and teach contemporary and tradtional embroidery and embellishment workshop for children aged 5-14. If you would like more information about the YE workshops please get in touch here . If you are a group or organisation looking for a workshop idea, please get in touch. I can travel to a venue of your choice to host a group workshop. I have previously ran group workshops with schools, textile groups, art and craft groups, art organisations and festivals amongst many others. Workshops can be tailored to suit you and your group so you can get the most out of the class. I also offer one on one workshops if you are interested in a more in having a more in-depth, individual session. I can travel to a venue of your choice to teach the workshop. In order the get the most of of your session before a 1:1 session I discuss via email what you would like to learn/develop, and the different techniques and materials that we are going to work with. Individual workshop sessions can be booked for minimum 1/2 day session. For prices and further info please get in touch here. If you have any questions regarding the workshops please feel free to get in touch with me via the contact form below.